Less than a year ago I closed my dress shop, and I am very happy to still provide guidance & assistance with dress buying. Recently, a friend call to tell me that her Daughter is getting married. And, could I offer some advice for the Wedding Gown? Yes! Background information first, the bride is a petite size 2 getting married on the beach, and Mom and Dad have offered to pay $800 towards the gown. Frankly, I am a firm believer that you can find a beautiful dress for under $1,000, and to pay much more than that is just absurd. My favorite Bridal shop close to the Bride is Uptown Bridal in Chandler, Arizona. The gowns are beautiful and I have heard extremely favorable comments about the customer service. Every time I pass the store front I swoon a bit over the stunning gowns on display. A well kept secret is pre-owned gowns. There are many websites and brick & mortar stores, and more pop-up everyday. A quick search will find Bridal resale shops in your area, and fantastic options on-line. Another little known secret is to purchase a designer gown in white (or ivory, off-white, silver,etc). These may be marketed as pageant or prom gowns, but essentially are high-quality, gorgeous gowns that are significantly lower priced than a “bridal” gown. The best time to shop for these gems is in the spring when stores are fully stocked for prom, and manufacturers are cutting the largest quantity. There are some absolutely stunning gowns that are perfect for a destination wedding, such as the beach wedding example. It is really impracticable (and looks silly) to wear a large puffy dress with train for a beach ceremony! Another item of note is the difference between “Couture” which are typically tens of thousands of dollars and traditionally one-of-a-kind, versus special orders. Think of special orders more like a dress that is not cut & sewn until you order it, but it is a selection of pre-defined fabrics and cut to a set size chart. The dress is not custom made for you in any way “custom” is it still made from the basic pattern and size chart, regardless of your exact measurements. In fact, many bridal shops will order the next size larger to guarantee that dress can be tailored to fit you perfectly, for an extra charge. This will cover any weight gain, padded bra, or any number of changes to your original fitting because it is much easier to alter a dress down to a smaller size than to have a dress that is just too small. Our Bride is petite and should plan for a hem. 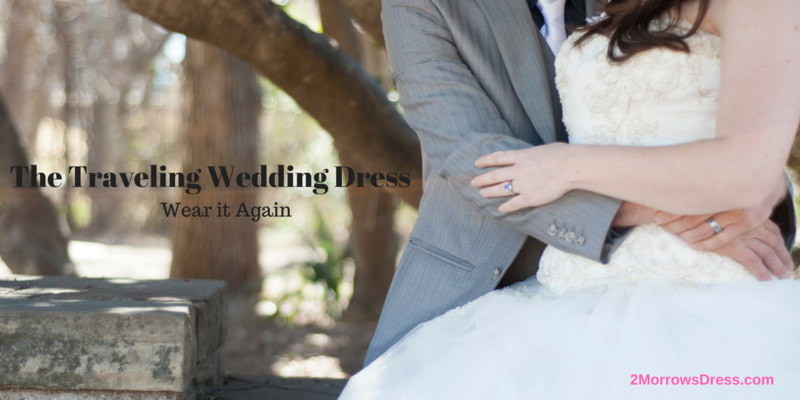 Otherwise, ask about alterations before any gown is purchased. If the correct dress is ordered, or better yet purchased “off-the-rack”, then very little alterations should be required. Search on eBay or any resale website to find tons of (new) spectacular designer gowns under the $800 budget. The wedding gown is such a huge part of your day, but that does not mean it has to be such a huge part of your BUDGET!